The Internet has provided us with many wonders, from skateboarding dogs to Chuck Norris facts. Over the past year, though, one sensation has dominated the Web: LOLcats. Here’s how it works: First you find a picture of a cat online, and then you add a caption that reflects the cat’s point of view. Just remember that although cats can speak English, their spelling and grammar is not so hot. Once you’re done, you have a LOLcat (laugh out loud cat). 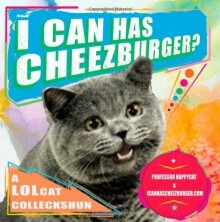 Since its founding in January 2007, icanhascheezburger .com (named after the most famous LOLcat of all) has been the center of the LOLcat world. I Can Has Cheezburger? collects 200 LOLcats from the enormously popular site, some classic and some new, in glorious and glossy full color. The book also highlights legendary LOLcat forms recognizable to fans everywhere (including “Do Not Want,” “Monorail Cat,” and “Oh Noes!”), and offers a guide to the finer points of LOLspeak. Packed with witty and endearing images and published into a proven cat-egory, I Can Has Cheezburger? is sure to delight feline aficionados and Internet nerds alike. LOLcats never fail to make me smile, even though some of the captions are just plain stupid. The Internet meme in a book. The selection of pictures is nice; some of them are really funny. What can you say about a book of LOLcats? It's an amusing way to spend a few minutes, at home or on the go.